Hello there. I found this article interesting as I'm currently playing a Dwarf 2 Weapon Fighter with Dwarven Waraxe and Light Shield. One part of your explanation piqued my interest. "...these feats should be combined with Weapon Training in the Close group of weapons. This will ensure that even though you've taken feats to make your main weapon (sword is the place holder) more effective, you're still getting a bonus to hit and damage with your shield too." What exactly do you mean here? When you say getting "Weapon Training in the Close group". Might I be missing something to pass this bonus on to my shield? What it means is that you start early on by taking Weapon Focus and Weapon Specialization with your Main Weapon (assumed to be a sword, ax, etc.). Your shield is your secondary weapon, which you will be shield bashing with. Shield bash is part of the Close weapon group, and when you select that group is allows your shield bash to keep up with your main weapon as far as bonuses on attacks and damage go. It does, as I looked into this further on the Paizo website I realized this. Thank you for the clarification. On a 25 point buy, how would arrange you arrange your points? Jimmy: I do not personally belong to any groups that use point buy systems. Since I'm not experienced with that method, I don't feel qualified to answer the question. You need a dex of 19 at some point, from there on out it's asking what stats you can dump and which stats you have to pump. Put your +2 racial in Str and save up for a Belt that gives +4 to both Dex and Str. I have debated the thought of picking up the Dual Talented Human variant racial trait, but i would lose the extra feat and skill point. I'm curious as to why you say a 19 Dex is required by the end. The only feat I see on your list with a high Dex requirement is Improved Two-Weapon Fighting, but that only requires a 17. A 19 would only be required if you go for Greater Two-Weapon Fighting. Thanks for bringing that to my attention David. The assumption was that the character was going to keep going and eventually take Greater Two Weapon Fighting. Apologies for not adding it in or making that clearer. Would you consider adding Toughness to the list of feats? It seems more hit points is a good thing for a fighter. 3 problems with this build. 1. You need too many stats to be too high to pull it off. In anything less than a 25 point buy (which is rare, 20 is most common, and dice rolls will usually be around here too), this build is not viable. You can't get your strength, dex and con high enough unless you dump all of your mental stats, which comes with consequences. If you get that many points, put your strength all the way to the max, grab a greatsword and go to town. 3. How low did you dump your Wisdom? Are you sure you don't want to take Iron Will, rather than deflect arrows? What is worse, taking a few hitpoints of damage from an arrow, or suddenly believing that the rouge behind you is about to turn on you, and you need to kill her before she kills you? What is better, a +1 shield bonus to AC or the ability to reroll a failed will save? As the BSF you are the obvious choice for a charm/compulsion spell, and if you need to be rolling 15 or higher from level 1, scaling up to requiring a natural 20 at around level 7 onwards, every time your party comes up against a caster you are going to turn from an asset to the group, into a dangerous liability. You take a feat specifically to counter Ray spells - of which there are maybe 10 in the game, half of them are low level and/or pathetic (seriously, I found 3 decent rays below level 6 and two of them allow Fort saves - your one strong save). What you really want to worry about is the fact that even at level 14, a level 1 caster can have better than even odds to take you out of the fight completely - or worse. You have disruptive and spellbreaker, two feats designed solely to make it harder for casters to cast defensively - but with their low hitpoints and terrible AC, by the time you reach them they should already be dead. You are too focussed on defending against physical attacks - your shield gives you +2 AC over a two-hander, before enhancements, your armour training dex stuff will kick in at about level 7, and probably tail off after level 11 unless you pump your dex up to 20 somehow (although, why?) giving you an extra +2 AC over a two-hander with 14 Dex. So that's an average of +4 AC (more at higher levels, but less at lower levels where it matters more) at the cost of an absolute buttload of feats and a significant reduction in damage output, not to mention the dangerously low will save (anyone who doesn't understand the perils of a low will save has never come up against a succubus). Is it really worth it? Physical damage is more of a concern early game, where you will only have a +2 or 3, by the time you are really seeing the AC increase come into play you are starting to not care as much about physical attacks and your AC becomes almost redundant. Personally, I feel this build is far from optimal. Let's look at a Fighter who spend his points instead getting his Strength to 20 at creation. By level 6 he gets his first iterative attack, he has a belt of Giant's Strength +2, a +2 Greatsword, and a suit of +1 Full Plate Mail, costing about 15k (average for the level is 16k). He has Weapon Focus, Weapon specialisation, Power Attack, Furious Focus, Toughness, Iron Will and Improved Initiative as his feats. His AC, with his +1 Full Plate, Armour Training 1 and 14 dex, is 22. It won't get much higher, but his damage output will, and he hopes that he can take enemies down before they can do too much damage to him (improved initiative helps with this, and toughness helps him survive what damage he does take). He has two attacks per round, with Power Attack giving a -2 to hit and a +6 damage, although thanks to Furious Focus he only takes the penalty to the first attack each round. He has weapon training, a +6 to Strength, +6 BAB, Weapon Focus and a +2 weapon, for a +16 to hit. With Power Attack this becomes a +16/+9 Full Attack, each dealing 2D6+18. I think your build was doing something like 1D6+7 per hit, at only about a +9. How about a one level dip into cleric and selecting travel and liberation domains for added mobility? Oh, even better, a one level dip into inquisitor... bonus will save, travel domain for extra speed, a few spells, intimidate as a class skill. Dipping into a medium BAB class means your BAB progression is hampered, meaning you hit slightly less and your iterative attacks will come later than otherwise. Not the biggest thing, but definitely a point against. The judgements of the Inquisitor, are a nice boost, although only once per day. Pick the +1 to hit to make up for losing a point of BAB, or the bonus to damage if you have no problem hitting, or at low levels making your sword count as magic can help bypass otherwise tricky DR. Being able to choose each time is good. The +2 to Fort is kinda cool, the +2 to Will is almost as good as a feat (and stacks with Iron will if you want to take that as well). Monster lore is never going to be your thing. You are not the knowledge monkey, you should not be wasting your few precious skill points on knowledge. Although speaking of skill points, getting 4 more than you normally would is kind of cool. Intimidate is already a class skill for Fighters, although inquisitors get a bonus (only +1 unless you do a bit more than dip) but your wisdom shouldn't be high enough for many of the inquisitions (like adding your wisdom to your intimidate - nifty, but not worth it). Personally I like the Spellkiller Inquisition - Disruptive as a free feat as well as +2 AC whenever you defeat an enemy and bonuses against spellcasters. Only getting one domain/inquisition instead of the cleric's two is unfortunate, as there are so many good ones to choose from. With 12 Wisdom you will get 2 spells per day. If I find you casting spells in combat instead of attacking, I will hunt you down and slap you, so make them non-combat spells (or maybe a cure light wounds in case your cleric gets knocked down or something). There are a bunch of useless ones to sift through, but also a bunch that could be useful in a variety of situations. It's up to you, but make them count. All up a dip into inquisitor can add a lot of variety to your character, and make you much more versatile, but this does come at the cost of hampering your damage output. Mostly this will only be noticed every fifth level when all the pure straight BAB classes are getting their next iterative attack, but there are also a couple of cool class abilities that will be delayed (like weapon training). So basically it's up to you whether you think it's worth it for your character. If you're not really much for social type things, and just want to hack and slash better, dipping into Inquisitor will not do that, even if you do increase your base speed by 10 feet - it really doesn't make that much difference, at level 7 a fighter can move at full speed in heavy armour anyway. If you're just after increasing your base move speed, then maybe a dip into Barbarian would be another way to go? You need to be wearing medium armour to get the bonus speed (although for 9,000gp you can make your heavy armour out of mithral and it will count as medium - something you'll probably be able to reasonably afford around level 8-10). You still get the +2 fort and keep your BAB progression at max, more than making up for the judgements, and you get ~7 rounds per day of RAGE - more hitpoints, hitting harder and more often, with an Iron Will effect thrown in for good measure (although at the cost of -2AC). Unlike the Inquisitor you only get this Will bonus when you're raging, but you will be most of the time when you'll want this anyway so that's not much of a problem. I'd actually recommend going Invulnerable Rager archetype and dipping for two levels - you get DR1/- and pick up a Rage Power (Secondary gore attack maybe? Easy trip attempts if you like?) 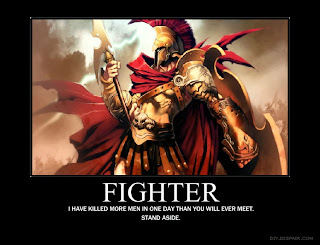 which I'd say is probably worth most feats (as a fighter you should have all the feats you really need by now anyway). This also gives you another 2 rounds of rage per day. I'd say it's a rare day that you'd need more than 10 rounds, but that depends on your game. Barbarian certainly looks like a pretty good option to take if you're wanting to put out more damage, and can afford the armour (either lower AC or higher price), so you need to balance that against the spells of the inquisitor - because let's face it, the spells and the domain/inquisition are the only major things that the inquisitor dip has going for it. Interesting thoughts Librain... I'll have to look into it. Barbarian does need to be non-lawful though, which can rule it out for some characters. 1. The increased base move speed works with heavy armor. The barbarian is limited to medium armor. Then at 7th level (8th in this case) the fighter will get another bump in speed with plate mail. 2. The +2 will save with inquisitor is priceless, and comes without raging. Plus the +2 fort also useful. 3. The spell casting gives some flexibility, especially duration spells cast before combat. 4. The judgements will have limited use at higher levels, but may be useful for select combats, particularly as a swift action (rage is probably more useful, but comes at a cost). 5. Ability to use cure wands very useful. 6. For me I prefer the inquisitor dip. But that's just me. The best Two Weapon Fighter uses a shield and...another shield. You can only benefit from one of them, as far as your AC goes. But Weapon Training, Weapon Specialization...Shield Master? Plus, you suddenly become able to wield weapons with +15 worth of enchantments. Of course, even with that silly concept, you're still better off going with a two handed weapon. Much higher damage, less Feats involved, and more versatile. I only half agree with this build. You see I don't take disruptive or spellbreaker I would go with vital strike and improved vital strike and deal the damage all around. Plus what about combat reflexes high dex kills with this feat. 19 dex 4 extra attacks(winning). Also sword and shield synergy is a 3th party feat by 4 winds fantasy gaming it allows you to use two weapons and a shield while attacking, and in two weapon defense. And shield expert. You have a block wall with blades (come at me bro). Top of the last few feats with dodge, mobility, spring attack, whirlwind attack, and greater vital strike. Plus power attack, cleave and greater cleave. (One man army killer) ggmf gtfo. Power Attack is a staple of melee fighters everywhere and should be taken at level 1. Combat Reflexes is near useless without reach, but with it can be great - especially in combination with Stand Still. Dodge is not great, but an extra +1 AC is far from terrible. Literally every other feat you mention is terrible. Some are simply not great for your build, others are just utter trash, one is 3rd party (and doesn't do anything for us anyway), and one (shield expert) doesn't even seem to exist. You think these stack. The only way you could actually think these feats are all worth taking on the same person is if you think you can Greater Cleave on a Whirlwind Attack with Greater Vital Strike quadrupling your damage, possibly while Spring Attacking for the added mobility. You can't. Literally none of those things can be used with each other, and none of them can be used in conjunction with your normal full attack, which is almost guaranteed to be superior in almost every way. And you're spending somewhere around 11-12 feats on the most feat intensive of the standard builds. That, quite honestly, is an absolutely terrible, terrible, terrible deal. I'm not trying to be cruel here, but that build will not work unless your GM is willing to ignore several rules that were put in place specifically to stop you doing what you want to do here. Some aspects of it could work on a great sword-wielding Bloodrager or something (Druids with Wild Shape and Shillelagh can get a 32d6 Vital Strike at level 12) but none of it will work on a sword and board fighter. You will be stuck looking proud of your 30 damage hit while the rogue pats you on the head and unwinds for well over 100, and the Barbarian looks pitifully at you before pouncing onto a CR 14 Red Dragon and mauling it to death in the first round. And let's not even get started on what a Wizard will be doing at that level.